“Don’t judge a book by its cover”…or so the saying goes, but I have to admit I’m usually guilty of doing just that. 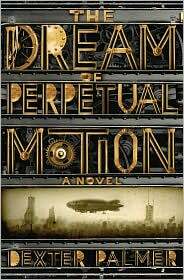 The steam-punk feel of this cover is what really drew me to it in the first place. I’m new the the genre, so I’m in no means an expert, but this book seems to not quite be the usual steam-punk adventure. I don’t have a problem with this, but if you’re looking for fast paced adventure, you won’t find it here. The book felt more like a short story to me, rather than a novel, and for a long time I didn’t really think I liked it. All of the characters are seriously flawed and a little crazy, so it’s difficult to really connect with any of them or care too much about what ultimately happens to them. The story jumps around and is told largely from the perspective of the main character Harold Winslow, who is trapped on an air ship driven by a perpetual motion machine that seems to be failing. He tells his tale mainly through a series of flashbacks with other characters occasionally interject their perspectives as well, and you don’t really understand what is going on until the end. It’s also kind of a downer, so to speak, and not my usual type of reading. Having said all that, I found that despite all the things I didn’t really like about it, it was so strange that I kept going back to it, trying to figure it out. The theme of the world created in this book was probably my favorite thing about it. The idea that the invention and dependence on machines had ruined the glorious “Age of Miracles” that had existed prior; a time when angels were real and walked the earth. Although, I was a little confused about that. I couldn’t tell if he meant that that world had indeed existed just like that, or if it was something that people had invented in their own imaginations, in an effort to cope with the bleakness of their current lives. Ultimately, I’d have to say this was not one of my favorite books, but I’m glad I read it. It’s always good to read a little out of one’s comfort zone. My time was certainly not wasted.